Over the past year there’s been lots of mortgage rate reductions in the Irish market so we thought it would be a good time to check out who’s offering the best value and to show you how much you can save by switching. 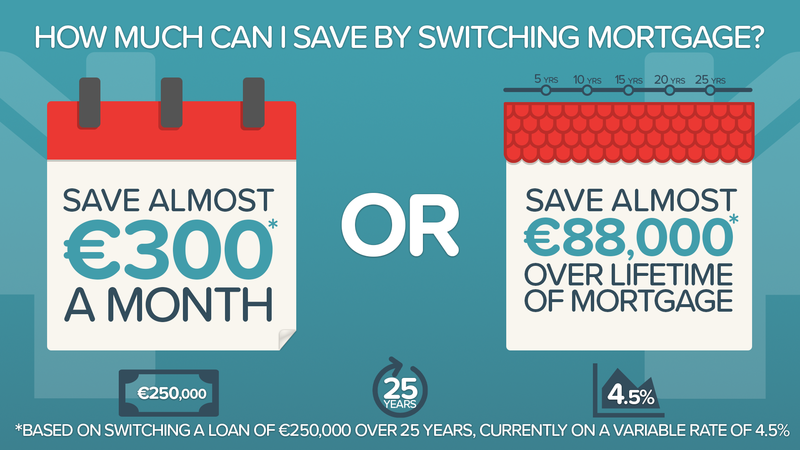 We’re obviously a big fan of switching here at bonkers.ie but particularly when it comes to mortgages as the savings over the lifetime of the loan can be huge! We’ve taken a look at all the mortgage lenders in Ireland to find out who's offering the best rates and what you could save by switching. All our comparisons are based on someone who’s looking to switch a loan of €250,000, being repaid over 25 years, who’s currently on a variable rate of 4.5%, and has between 60% and 80% equity in their home. Your potential savings could be more, or less, depending on the rate you’re actually paying and how much you're looking to switch, for example, but it’ll give you an idea of what you could save. Which banks offer the best mortgage rates? Let’s first look at fixed rates, which currently offer the best value for mortgage customers. Across all banks and time periods, the best fixed rate on offer at the moment for those looking to switch is the 2.30% fixed rate over two years from Ulster Bank, which works out at a repayment of €1,096.53 a month. So if you’re currently on a standard variable rate of 4.50% that works out at a saving of €293.05 a month or a saving of almost €88,000 over the lifetime of the loan! Second best is KBC who have a 2.50% fixed rate over one year. This works out at €1,121.54 a month or a saving of €268.04. However, to avail of this rate, you'll have to have or open a current account with KBC. In joint third is Ulster Bank again who have a 2.60% fixed rate over four years, and KBC, who have a 2.60% fixed rate over three years. This works out at a monthly repayment of €1,134.17 or a saving of €255.41 a month. Not bad! Next is KBC's 2.65% rate over 5 years, which works out at €1,140.52 a month or a saving of €249.06. Again, to get this rate you must also have or open a current account with the bank. If you’d prefer the flexibility of a variable rate, the best rate on offer is 2.95% from both AIB and Haven. This equates to a monthly repayment of €1,179.04 or a saving of €210.54 each month. In recent times Irish mortgage holders have been reluctant to switch mortgage provider but as you can see the potential savings for those who do switch can be huge. Many lenders also have dedicated switch teams in place to make the process as easy as possible so it often won’t be as much hassle as you think. And while there are costs associated with switching mortgage provider, in some cases banks will provide cashback to those who switch or a contribution towards the legal fees. However, a word of caution. If you’re currently on a fixed rate you’ll need to wait until the end of the fixed rate period before you can switch mortgage provider, otherwise you’ll be charged a breakage fee. And if you’re lucky enough to be on a tracker mortgage, the chances are you’re already on the lowest rate available so there would be no point in switching. To see exactly how much you could save by switching, check out our handy mortgage calculator.